Some businesses and some people will emerge from today's economic tumult stronger and more dominant than when it started. Others will weaken and fade. It all depends on critical choices they make right now. Geoff Colvin, one of America's most respected business jour-nalists, says even the scariest turbulence has an upside. The best managers know that conventional thinking won t help them in tough times. They re taking smart, practical steps frequently unconventional and even counterintuitive that will not only keep them strong, but will also distance them from the pack for years to come. The dozens of top-performing leaders Colvin interviewed reject the common view that slashing costs and firing employees are the only effective tactics. 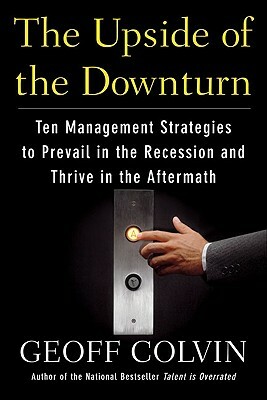 They see volatility as a rich opportunity to reinvent their organizations and lay the ground-work for future growth. Colvin shows us how these strategies really work, using exam-ples of major companies that have successfully applied them. GEOFF COLVIN, "Fortune"'s senior editor at large, writes its popular column "Value Driven." He lectures widely and is the regular lead moderator for the Fortune Global Forum. He also offers daily business commentary on the CBS Radio Network. His first book, "Talent Is Overrated," earned international acclaim and was a "Wall Street Journal, BusinessWeek," and "New York Times" business bestseller.